If you take the right hand fork, the path continues further up the kloof eventually coming to one of the forestry huts, Middleburg Hut which is used by overnight hikers. You return down by the same path. This a very pleasant gentle walk from Algeria up the valley to Uitkyk Forestry house. The path is clearly signposted from the end of the campsite. (When the path to the waterfall goes off to the left, you continue straight on to a grove of pine trees.) You walk all the way to Uitkyk (approx 3.5km) and then return along the road to make a circular walk. The circular walk would take approx 2 hours (7km). Drive to Dwarsrivier farm and continue for approx 1km and then turn left to Sandrif resort, cross over the river and continue via the signposts for approx 1km up a gravel track to a small parking place. This is a steep mountain walk with some easy scrambling at the top to get into the largest ‘crack’, a narrow cleft reaching 30m into the bowels of the Wolfberg. The walk should take you about 1½ hours to go up and 1 hour to return with additional time on the top exploring – less if you are fit. 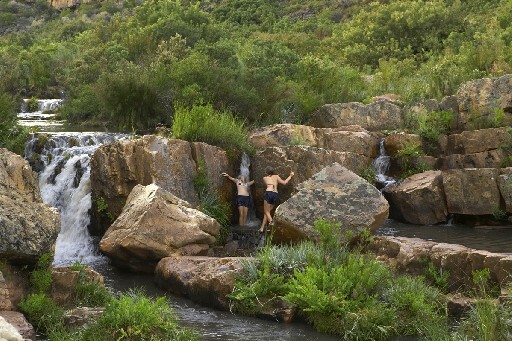 Collect a permit from Dwarsrivier Farm and then follow their map to the start of the walk. 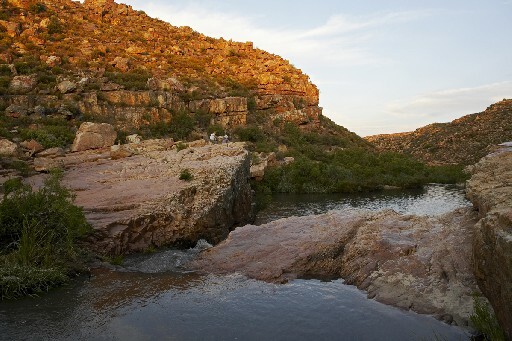 (Drive for approx 0.7km in the direction of Clanwilliam, turn off to the left to follow the gravel road for approx 7km to a small parking place.) The path is very clear. It is a moderate uphill climb to the Maltese Cross with magnificent views of the Cederberg range and then a downhill return the same way. The cross is approx the height of a five storey building and begs the question of how on earth it got there! (In reality, the land and rock around it eroded away leaving this monolith behind.) The Maltese Cross takes about 3 hours including a break at the rock formation, allow 3½ to 4 hours if you take it slowly (7km). Drive to Dwarsrivier farm and continue for approx 1km and then turn left to Sandrif resort, cross over the river and continue via the signposts for approx 1km up a gravel track to a small parking place. This is a steep mountain walk with some easy scrambling at the top to get into the largest ‘crack’, a narrow cleft reaching 30m into the bowels of the Wolfberg. The walk should take you about 1½ hours to go up. From here you continue along the top of the mountain range for about 1½ hours to the 15m-high Wolfberg Arch. It is best to return the way you came as the other route down, via Gabriel's Pass, is less well marked. Allow 7 to 8 hours for the walk though you may do it faster. Note: You will need a map eg Cederberg map by Peter Slingsby, plenty of water, sunblock, comfortable shoes, hat and Cederberg Wilderness permit (as specified) obtainable from Algeria Forest Station or Dwarsrivier.